Book a The Phantom of the Opera Theatre Break and become a part of history seeing the longest running musical in London. Seen by over 100 million people worldwide, Cameron Mackintosh’s The Phantom of the Opera is the highest grossing musical of all time. Now in its 30th record-breaking year, this multi-award winning musical continues to captivate audiences at Her Majesty’s Theatre in London’s West End. Andrew Lloyd Webber’s mesmerising score magically combines with jaw-dropping scenery and breath-taking special effects to bring this tragic love story to life each night. 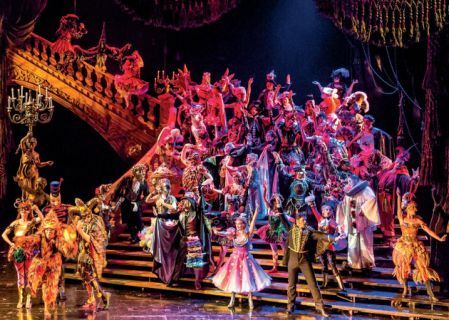 This musical version of The Phantom of the Opera, based on Gaston Leroux’s gothic novel, is a must do Theatre Break in London for any lover of music at its best. Far beneath the majesty and splendour of the Paris Opera House, hides the Phantom in a shadowy existence. Shamed by his physical appearance and feared by all, the love he holds for his beautiful protégée Christine Daaé is so strong that even her heart cannot resist. The Phantom of the Opera Theatre Breaks are the jewel in the crown of London’s West End as well as being seen in 119 cities in 24 countries and played to over 80 million people. Awards include the Laurence Olivier and Evening Standard Award for Best Musical and seven Tony Awards. Andrew Lloyd Webber’s most romantic of musical Theatre Breaks of life beneath the stage of the Paris Opera where a mysterious masked man falls in love with Christine, a young singer, who inspires “the music of the night”. Casting news : Ben Forster (Elf, Jesus Christ Superstar), one of the youngest actors to play the Phantom, will continue in the role through to 2nd September 2017 along with Celinde Schoenmaker and Nadim Naaman as Christine and Raoul respectively.